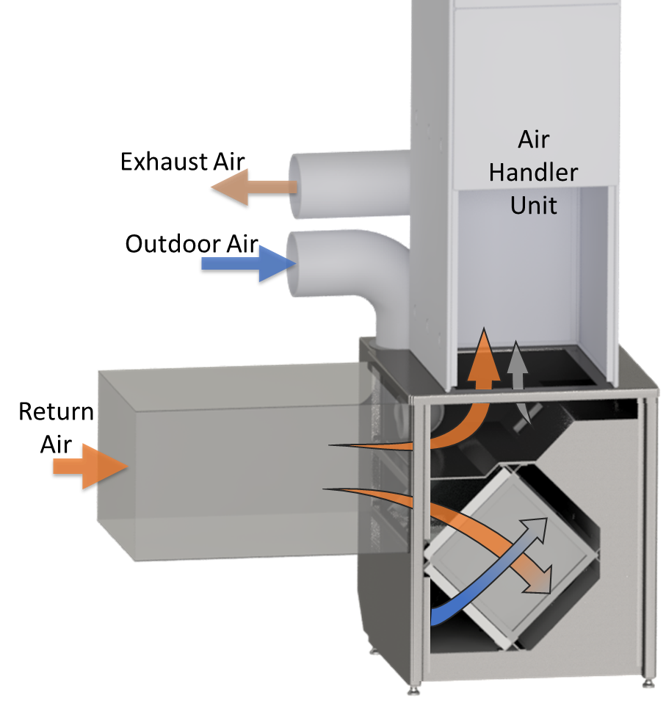 When integrated with the HVAC system, most E/HRVs don’t deliver the desired ventilation air. A new design seeks to solve this problem, but we need your input. Builders believe that if they install an Energy Recovery or Heat Recovery Ventilator (E/HRV) they have ensured good indoor air quality. In reality, that’s seldom the case. To deliver the needed fresh air, an E/HRV must be installed in a way that guarantees balanced airflows—where the intake and exhaust airstreams move equal volumes. But the design of these units makes proper installation difficult and, when integrated with the HVAC system (as most are), almost ensures that they fail to work as advertised. Of course, an E/HRV costs more than other ventilation strategies, so if it doesn’t do what it’s intended to, the builder has wasted that extra money. Steven Winter Associates is collaborating with a major manufacturer to develop an ERV that solves the shortcomings of conventional units. We have completed the second prototype. We hope to have a final design by Fall of 2019 with commercial availability sometime in 2020. Before moving to the final design, however, we would like input from the EEBA audience to make sure the product will meet your needs. We have included a link to a short survey at the end of this article. Let’s start with typical duct configurations. If the E/HRV’s intake and exhaust ducts aren’t similar lengths with the same number of bends, their resistance to airflow will vary, throwing the unit out of balance. To compensate, some manufacturers provide static pressure taps that let the installer adjust the unit’s fans during installation. That compensation might be sufficient for an E/HRV that has its own ductwork, but it won’t be for the majority that are integrated with the HVAC system’s air handler unit (AHU). The following two scenarios explain why. Scenario 1. Here, the E/HRV pulls stale air from the return duct, then delivers tempered outdoor air further downstream in the same duct, closer to the AHU. For this to work, the E/HRV needs to run in sync with the AHU fan. However, this also results in unbalanced air flow, as the larger AHU fan will impact the smaller E/HRV fans. In this case, result will be more supply than exhaust air. The unit could be adjusted at startup to compensate for this imbalance (though we don’t commonly see this in the field). The problem is that most of today’s AHUs have two-stage or variable-speed fans, so the E/HRV can only be balanced under one of those fan speed conditions. Scenario 2. Here, the E/HRV pulls stale air from the return ductwork and delivers tempered outdoor air to the AHU’s supply ductwork. While manufacturers recommend the AHU fan run in unison with the E/HRV, most don’t require it and with the AHU off, the unit may end up ventilating the AHU but not the rest of the home. Next, let’s look at cold climate frost prevention controls. When the outdoor air falls below a certain temperature (which varies with the E/HRV model), the core will be at risk of freezing. Manufacturers prevent this in a variety of ways, none of which are ideal. On/off cycling. When temperatures fall below the frost threshold, the unit switches off for a set period of time (in really cold conditions, this could be 20 minutes or so each hour) to give the core a chance to warm up. Air recirculation. Here, the outdoor intake and exhaust ports are closed, and indoor air redirected through the core’s outdoor air pathway to warm it up. During this period, no whole-house ventilation is provided. Exhaust only. Some units run in exhaust-only for a period of time allowing the core to warm back up. During this period make-up air will be supplied through leaks in the building envelope. In each case, the home has poor or no ventilation during frost prevention. Alternatively, an electric resistance pre-heater can be installed in the outdoor air duct to prevent frost from forming in the core. This maintains continuous airflow but is energy intensive. A proper E/HRV installation leaves enough space around the unit for regular maintenance, which includes periodically changing the air filters and removing the core for cleaning. Based on what we see in the field, I wonder how many builders and installers understand this. Many installations make it difficult to access the filter and core, while in other cases access is blocked by ductwork and plumbing that was installed later. You would also assume installers know how to connect the ducts, but I’ve seen a lot of problems here as well, including supply and exhaust ducts hooked up to the wrong sides of the E/HRV. I also see a lot of flex duct that’s not pulled tight, creating static pressures that can severely restrict airflow through either side of the unit or both. With support from the DOE’s Building America program and industry partners, Steven Winter Associates is developing an integrated ERV that will make balanced ventilation easier in homes. Our design includes the following improvements. 1. Simplified installation through a better form factor. The unit will connect directly to the return side of an air handler and will pull stale air from the air handler’s return ductwork. Not only does this avoid the drawbacks of each configuration type, but the fact that the ERV unit only needs two duct connections rather than four makes proper installation easier. The unit is sized for mechanical rooms with standard ceiling heights. For an up-flow configuration, the total combined height of the ventilation unit, the air handler, and a standard supply plenum will be less than 8 feet. Maintenance access for the core and filters is also from the front, so it matches the service area required for the AHU. 2. Fans that ensure balanced ventilation under constantly varying conditions (varying AHU fan speeds, outdoor winds and indoor pressure changes, for example). We are incorporating ECM fans. Nothing new here, right? A lot of E/HRVs have ECM fans. But rather than the typical constant torque ECM fan we are using constant flow fans, which will maintain roughly a ± 5cfm airflow range. This also allows the unit to be configured with MERV 13+ filtration. The system is designed to maintain balanced whole-house ventilation during the frost prevention cycle without using electric resistance pre-heat. It does this by using a modulating damper to mix a small amount of air from the AHU supply duct with the outdoor air to pre-temper it above the core’s frost point. Overall airflow through the outdoor air pathway of the core is increased, but the portion of outdoor air to exhaust air remains balanced. Have I piqued your interest? Then take a look at the drawing above. As we continue to make refinements to the components and controls, we hope you will assist us with some feedback. This will help us ensure that the final product truly meets the industry’s needs. We have posted a short questionnaire online that will help us better understand your approach to whole-house ventilation as well as what features we need to prioritize. The survey takes five minutes or less and can be completed anonymously. We thank you for your interest and look forward to hearing from you. Srikanth Puttagunta, PE, is a Principal Mechanical Engineer with Steven Winter Associates, Inc.
Be the first to comment on "The Problem with HRVs"